I’ve been very inspired to do more 1-pot meals lately. Don’t get me wrong, I love my baked chicken recipes, but the option of cooking it on the stove in 30 minutes or less is also super appealing! This year I decided I wanted to cook more with my cast iron pans. I must say, recipes such as this have been perfect for it! The chicken browns very nicely, and doesn’t stick, as the pan is seasoned. I love creamy chicken, with mushrooms especially. But typically, most of the cream-of recipes that you’ll find are made with cream of mushroom soups which contain flour (not gluten-free) and not to mention contain a bunch of unhealthy ingredients and a ton of sodium. I used a can of light coconut milk in this recipe and it added an amazing amount of creaminess, I think much more than you would get from the unsweetened almond milk that I usually have kicking around in the fridge. Since the base is coconut milk, this recipe could be easily made dairy-free. I personally use butter as we don’t have dairy allergies here, but something like Earth Balance or a vegan margarine would work fabulous. I got a rice cooker recently, so my hubby was excited to have basmati rice. I don’t cook white rice very often, as we always opt for brown rice, but the mildness of the basmati rice made a nice accompaniment to this particular dish. It would also go great with brown rice, quinoa, or even mashed cauliflower or spaghetti squash (one of my personal favorites). In case you’re wondering, you can’t really tell its coconut milk in there. I thought, that it may be too strong of a coconut flavor, but once the seasoned mushrooms were in, it was almost in-detectible. Its mild enough that its kid-friendly. My 2 year old (the meat eater), loved it! I hope you give it a try for a quick weeknight meal soon! This Cream of Mushroom Chicken is made with no soup! Healthy, gluten-free and can also be made dairy-free. Done on the stove top in 30 minutes. Melt the 1 Tbsp of butter, and add the sliced mushrooms, spreading around the pan evenly so they can brown. Once mushrooms browned on one side, add in the chopped rosemary. Cook down the mushrooms. In the last few minutes of cooking, add the chopped garlic. Season with salt & pepper if using. Remove the mushrooms from pan and set aside. To the same pan (don't clean it! ), add in the chicken breasts (season lightly with salt & pepper if using) and brown on both sides (about 5 min each side). Remove chicken breasts from pan and set aside on a plate. They won't be cooked through yet, that's ok.
To the same pan, add the other 1 Tbsp of butter, and 1 Tbsp of flour and whisk it together to make a rue. Cook the butter and flour together for about 20 seconds on medium/high heat. Then slowly add the can of coconut milk, while still whisking. 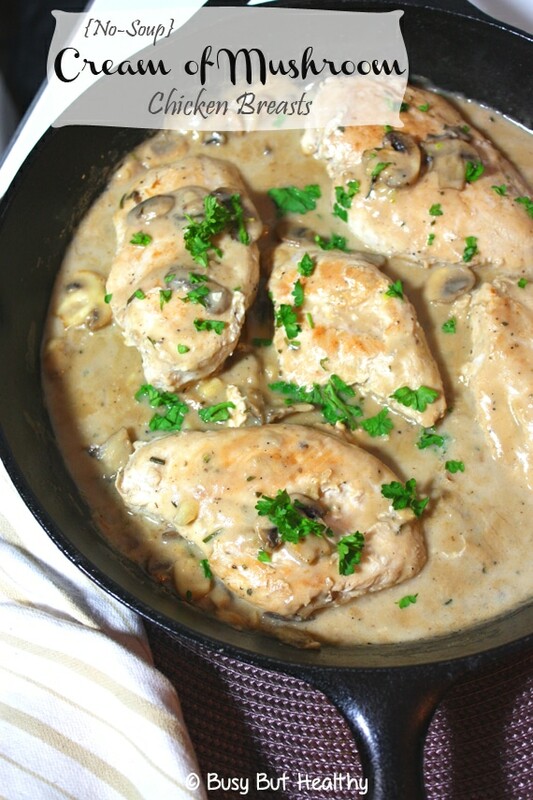 Once its the consistency of a sauce that's thickened, add back the mushrooms, then also add back in the chicken breasts. Allow it all to simmer together on low/medium heat for another 6-7 minutes flipping the chicken occasionally until the chicken breasts are cooked through. Serve with extra sauce poured on each serving. Wow that looks so good, and I like how simple it is to prepare. Thanks for your beautiful photography! The fact you pointed out “gluten free” like gluten is some kind of poison makes me laugh. Less than 1% of the worlds population has a gluten allergy. Then when you said coconut milk like it is some how healthier for you made me laugh even harder. How much coconut milk did you use, they didn’t have it canned in my grocery store so I had to get a 32 oz box version. Hi Heather! There is 14 oz in the can. So in cups that’s 1 3/4 cups. This was so good! Even my 5 year old liked it and asked for more mushrooms! I didn’t have rosemary, so I used dill instead and it was great! Thank you for another great recipe! This looks amazing! Unfortunately my husband isn’t a fan of coconut milk….any suggestions for substitution? Probably whole milk would be the best option. Its 3.25%. 2% or less wouldn’t have as creamy of a texture. Do you think this would work well in the crock pot?! Unfortunately I don’t think it would work well in the crockpot. I think the sauce would be watery as the steaming in the crockpot makes so much extra liquid.